59 dollars ... like that tutorials are present. Very nicely. I actually fell off for the suite... for 100$ I can only imagine the amount of hours these things will save me. Youre better get hired by Cameny for model texturing then. I dont know about getting a new job but i can very well see these kind of tools be used by the OT team for the terrain customization and maybe on user models. Like Ddo is essentially a kind of procedural texturing tool that apply parametric environmental effect on a mesh or on a multitude of mesh and on all map at the same time (diffuse. specular etc...). So it's kind of a similar approach as what OT is already doing. I don't know if they could use Quixel tool directly or if they would have to create similar tools, but i find this kind of stuff is really inline with the direction i think OT is going. Great thanks! Also is it much trouble for you to single out one model on a blender file? I'm afraid it would take me a long time to figure out which piece goes with which model. If so, get me the most basic one. If it works like i think it should work, i would do one model and then i could use the same material preset and apply it on the other models. I have to admit that quixel software is not as easy to use as i thought. There's a big learning curve at first and also the it's still in beta so it's not easy to find documentation but I think it should pay off in the long run. Ok i just saw that you grouped each material type on separate uv so it's probably not possible to single out one model. So i'll probably work one material at a time (across all model) so no need for you to single out a model. ... you could delete all the parts, till just one model remains and then do the baking / qixeling. It should keep the positions of the UVs and so you would just merge them (when you do it for each model) afterwards ... if it works as i think. 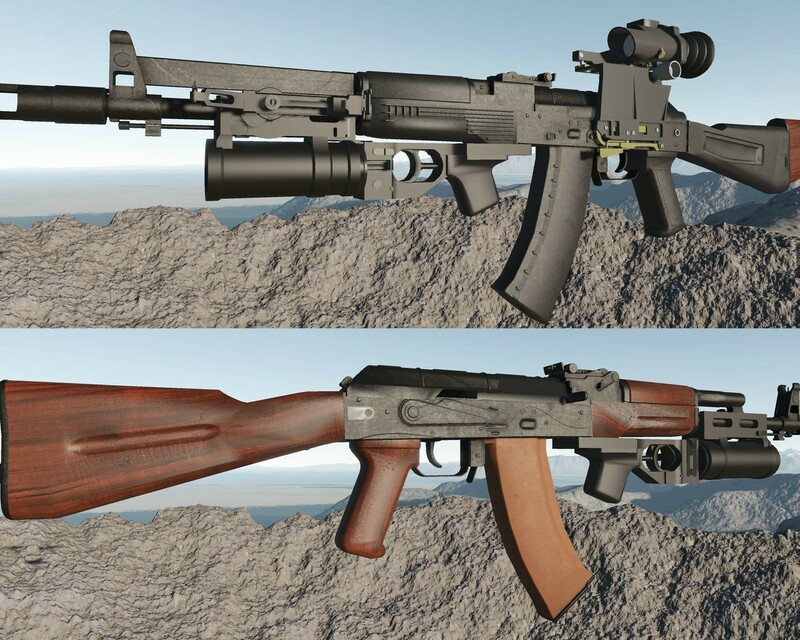 Finally got myself to get back on texturing Python's AK using the quixel DDO tools. I had a hard time with it last fall as the program was still in beta. It is not much more usable now. It's still basic texture but i think it should do for now. Here i have only have the wood and metal textured. Still have to do the mags and ABS. OMG M7 ! That wood looks smexy ! 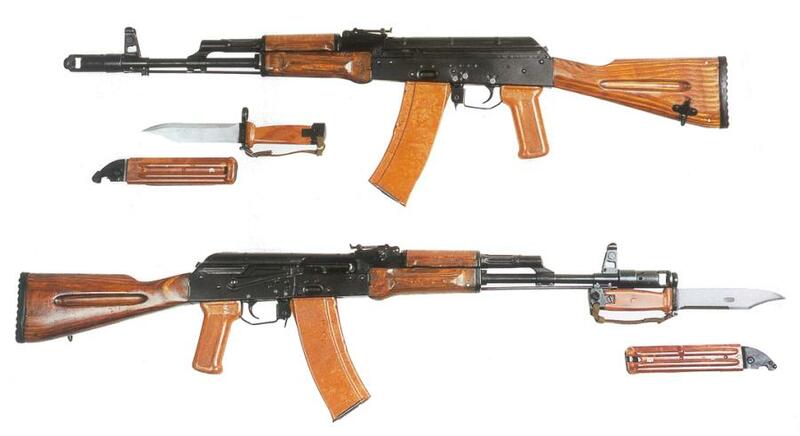 ... damn, i have to find time to UV the grenade launcher and optics .... and model an SVD and PKM next - theyre will look fabulous with that wood-texture. 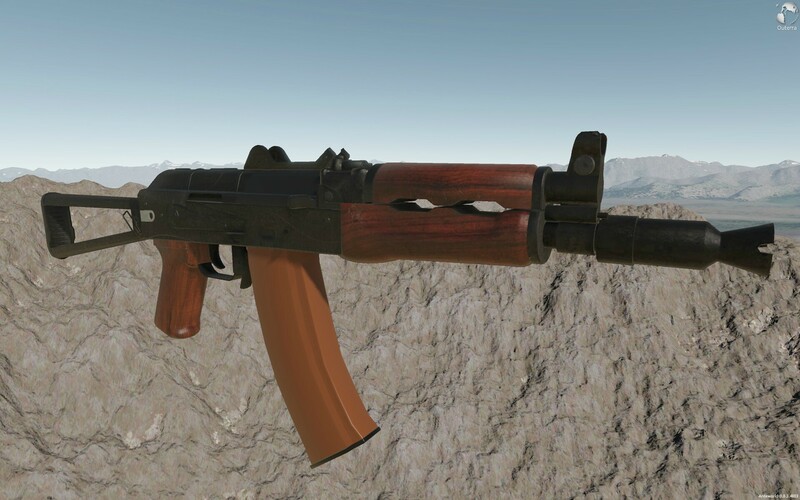 I have all the elements that was UVed textured now, except for a bit of metal that is on top of the orange Mag. Not sure why. The black ABS looks a bit too similar to the metal so i think i'll revisit the metal texture later when you'll have the scope and grenade launcher UVed. But i'm pretty happy with it for a first attempt. I made an embossed motif on ABS handle. I was not sure if it was something you wanted. The fire-selector has a bump on it to get fixed on the position, thats why almost all have the distinct white spline there ... basically its almost to a 1 mm wrip, made by going to fire n safety so much during drills. (no one ewer cared doe, as the metal itself is really resistant even in harsh conditions - izhmash knows theyr material science well indeed). Let me know if ya would like me to make an higher UV resolution, can quite imagine its a pain to pixel-precise paint when there is so much stuffed on it. It will take some whyle till i get to UV those other stuffs ... have lately a lot of unexpected things + yesterday an instant flood in the house to deal with ... ( and i wanted to have at-least the BTRs interior done already ) So il get to it much probably somewhere between christmas and silvester, when it all cools down a bit. Also, could i get those DDSs ? ... i want pretty much. its quite a chalenge to make nice wear edge with quixel tools when you dont have a normals map baked from a high poly mesh to a low poly. That's where the software finds most of its information to find edges (for the pros). i could always try do them manually but id really like to find a way to get them without using high poly->low poly baked normals. So ill try some more stuff. the bakelite material is interesting texture. i did see it while seaching on google but i went for the kind of plastic/abs instead. ill try to get a bakelite version. i dont need a higher res uv as i didnt use the one you provided. i made all maps at 2k but for the metal mesh i will try 4k as the uv has more meshes on it that the others.